Global stock markets climbed today, rebounding from heavy losses last week after the Federal Reserve left interest rates on hold. The Dow Jones Industrial Average gained 87 points, or 0.6%, to 16471 in early trade. The S&P 500 also rose 0.6%, after both indexes declined sharply on Friday. The markets steadies after the Fed decision, though many people debating whether the Fed is going to raise rates yet this year. We are most likely in for a period of choppy markets. Commodities: Gold prices jumped after the Federal Reserve’s decision a day ago to hold interest rates steady, Prices for the metal, which have lost more than 7% in the past year and have been bumping along five-year lows, touched their highest level in more than two weeks on Friday, gaining $20.80, or 1.9% to settle at $1,137.80 a troy ounce on the Comex division of the New York Mercantile Exchange. The gains weren’t limited to gold. Silver rose 1.2% to $15.163 an ounce, its highest level since late August. Platinum gained 1.6% to settle at $984.40 an ounce, and palladium rose 1.9% to settle at $610.85 an ounce. Since last week we have seen grain markets lose some ground. With our high of the week coming in on Tuesday at @ $3.95 for Dec corn and $8.94 for Nov beans. With a wide open week for harvest in many parts of the Midwest, it seems good harvest conditions pressure grains, despite good export numbers this am. Corn: Corn was a 2 sided trade this am opening lower, but pushing higher by 9am. Little to report as far as fresh news, conditions for harvest seem to be moving right along, wet corn programs popping up around as some producers get an early start. Ethanol remains steady, and exports can be debated (knowing there are cheaper supplies in South America). Also the feed and residual can be a variable to give us some movement. But without a story, we are likely to see corn push lower into harvest. Beans: Beans continue getting beat down by the same thing….dollar higher, Brazilian acres, uncertainty in China. At some point the story gets old, and traders move on. Not saying we will see a rally, just saying we need something more to make a new low than the same stories, with $8.53 ¼ being the bottom for the November contract. Seems like beans are happy in the range of $8.65-$8.94 as they have been since Aug 25th. At least until the story comes! In 2011 Walmart launched it “holiday layaway program” a month early (in mid-October), and now in 2015 Walmart launched it in August! Kmart airing its first Christmas commercial last year in September, so get ready for the Christmas toy commercials. Yikes! I personally enjoy Christmas, but I am tired of it before it even gets here. I mean really, Christmas? I haven’t even bought my trick or treat candy yet…..know why? 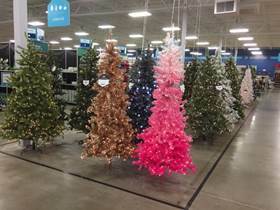 It not even October yet….. But consumers are to blame, apparently enough get excited and start buying. Retailers only begin early because it increases sales, so crank the Christmas tunes and head on over to your local store and pick up a zombie mask, a Christmas tree, and a gallon of milk.